The first flavors that I pick up is a moderate salt along with a lightly noticeable vinegar. The chewing brings on the black pepper, along with a bit of vinegar tanginess, and a touch of worcestershire. There's also a hint of coriander in the background. 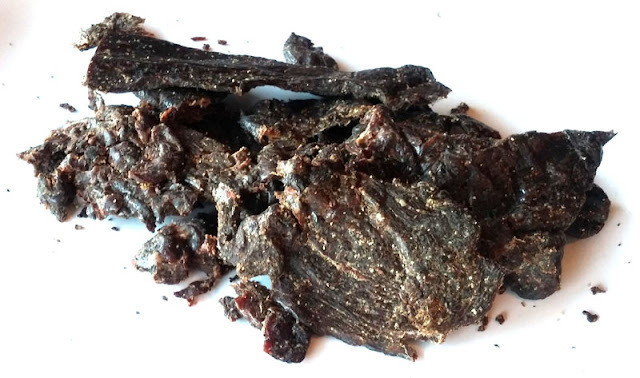 For being elk jerky, the natural meat flavors are hard to identify. They are there; they just don't stand out well against the marinade and seasonings. But the black pepper definitely shows up. I get a spiciness that I'd rate as "mild medium" on our heat scale (level 2 out of 5). The pepper does not have that fresh cracked flavor, although. 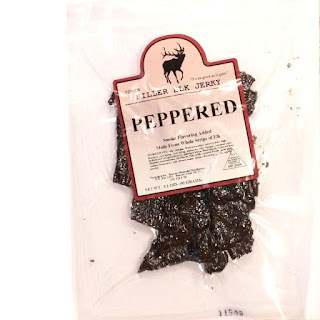 Otherwise, the primary taste profile is a vinegary, black pepper spice, with a mild worcestershire sauce. The saltiness feels high, but I think it's actually the black pepper spiciness making it seem salty. The meat consistency seems good. It looks to be mostly all meat. Biting off chunks is easy to do, and the chewing feels easy as well. It tends to chew dry, however. But, it does feels meaty, kind of like soft strips of tenderized filet. 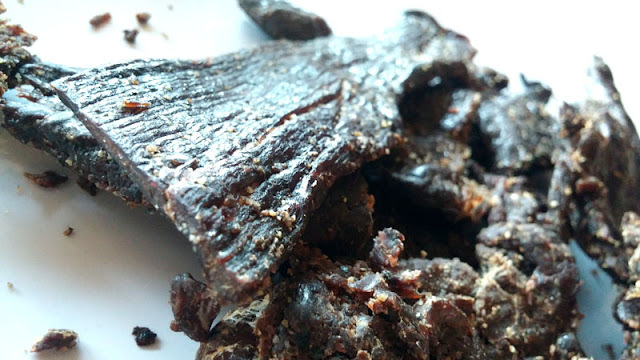 This Peppered Elk jerky from Tony's Killer offers a soft, meaty chewing experience, though mostly dry. I could not, however, get much natural meat flavor. The vinegar, worcestershire and seasonings tended to drown out what tasty goodness Nature had bestowed into Elk. Otherwise, what I got was a vinegary, peppery, worcestershire, which in itself is OK for awhile. But after several chews, I grew tired and really wanted to taste the Elk.